Talking about the specifications of JioPhone 2, it sports a 2.4″ inch 320x 240 pixels QVGA TFT Display. It runs on a 1GHz Dual Core processor along with 512MB RAM & 4GB internal of storage. You can also expand the internal storage up to 128GB via external micro SD card. JioPhone 2 Comes with 2MP Single Rear Camera & 0.3MP VGA Front Camera. The phone is powered by 2000mAh Battery with Micro USB Port. On a continuous usage, this battery can last up to 6 hours and can provide 150 hours of standby time. The new JioPhone 2 runs on Kai OS. You get Pre Loaded Jio Apps in this phone which is a plus point. Jio has promised WhatsApp and Youtube for this feature phone. It is available in Single Black Colour variant. 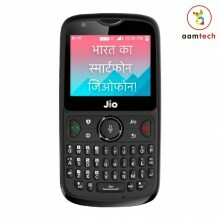 It is priced at around 2,999 Rs. This device is sold by Jio in a Flash Sale. Don’t Know if You can purchase this phone offline or not. Nokia X6 के कुछ हटके फीचर, जो आपको नहीं है पता ! आईफ़ोन को पछाड़ने वाले स्मार्टफ़ोन सैमसंग S9 और S9 प्लस हुए लॉन्च !